Jessica sent these in with no explanation, and you know what? I’ll let her slide. Happy Triforce Tuesday! 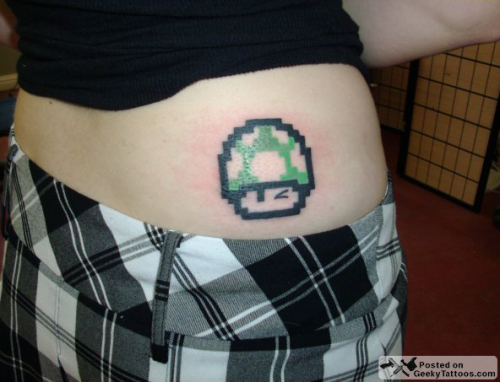 Posted in Tattoos, Video Games. Tagged with 1-up, hip, lower back, mushroom, Triforce, Triforce Tuesday, Zelda. Wow! great pictures! Can I get her number!? Desperate internet creepers are desperate. Desperate White Knight is Desperate! Chinge Chingas!! Imma be the nerdiest one here and ask "WHY THE HELL DIDN"T YOU GET THE TRIFORCE GOLD INSTEAD OF RED"?